Really sweet cottage, modernized in recent years, situated in a conservation area. Decorated to a high standard throughout. Ideal for romantic getaways, fun-filled holidays for small families by the sea, discovering Portsmouth, Hampshire & the South coast and business trips. Our cottage is spotlessly clean and has two bedrooms, one with large double bed and one twin - the twin has a 'zip and link' bed which can be made up into a large double. Our living/ dining room leads onto the bathroom and kitchen. Kitchen is fully equipped with everything you might need in a home away from home. Bathroom, as in many Victorian properties, is located on the ground floor. Garden has a patio area and lawn. We are located 15 minutes from the seafront and conveniently located for lots and lots of fun activities and attractions. Also, minutes away from Albert Road with it's many restaurants. A car is useful but not an essential. For those with a car, parking is available. For those without, there is a good local bus and train service. The cottage, as well as ideally located for visiting Portsmouth, is a perfect base for visiting the south coast and key locations further afield – central London is only 90 minutes away by train. Clean modern bathroom, with bathtub, on the ground floor. We're located on a small pedestrian street and parking is available on streets at either end of ours, a few meters away. There are no parking restrictions on these streets. Salt, pepper, vegetable oil, cling film and foil available for use. Patio area and lawn. Seating for 4 outside. •	The cottage is usually furnished with a few extras like foil, cling film, washing-up liquid, sponges, cloths, a few cleaning products; and a few pantry items like salt and pepper, vegetable oil, tea bags and sugar •	We have a lovely front and back garden •	The cottage has gas central heating and the hot water is always on •	Our ‘best fit’ guests are families, couples, solo and business travellers. We will consider 3-4 same gender individuals but booking agreement is subject to our discretion. Keith and Salva welcomed us and the cottage was very clean. They also allowed to leave our luggage until 4.30pm after we had checked out. 10 minutes to beach and close to places to eat. Parking good and public transport near if needed. 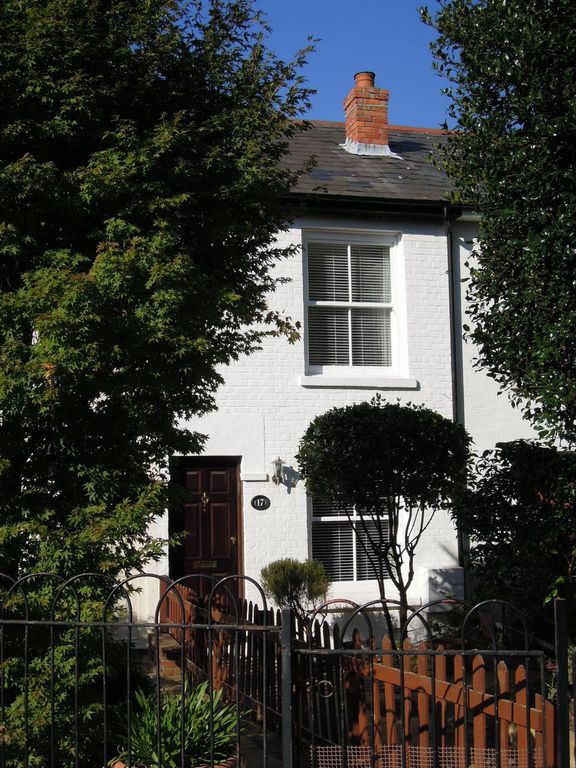 Looking from outside you can't guess how excellent the interior of this victorian cottage is, very well decorated, with a simple but agreeable furniture, and a kitchen and bathroom top of the range. The days were rather cold for our mediterranean like, but the house was always warm, thanks to the very efficient heating system. Its evident the care that Keith and Salva put in keeping all shining and glittering. And their hospitality is also just perfect. Congratulations on such a good example of welcome in all aspects. Very nice flat in a quit, superb situation near the sea. For us as family with two children (7 and 9), the cottage was the right thing for four days in the city with enough possibilitiy to rest as well. All was clean and the cottage is quit fresh decorated. The service was good, the description was accurate and we would recommand the cottage! This is a beautiful cottage in a lovely location - very peaceful but close to local shops, seafront and bus routes. It was extremely clean, very well presented and maintained and equipped with everything you would need for a holiday stay. I thoroughly enjoyed my stay there and would certainly recommend and re-visit. We enjoyed our stay at the cottage and would highly recommend anyone staying in Portsmouth stay here. It's a recently remodeled space with a large bathroom and nice kitchen. There was plenty of room for the 4 of us. It's a quick walk to the seashore and there are a good variety of restaurants within a 15 minute walk. Local parking - we're located on a small pedestrian street and parking is available on streets at either end of ours, a few meters away. There are no parking restrictions on these streets. Travelling By Train - the closest train station to the cottage is about 15 minutes walk and is ‘Fratton’ station. Other train stations in Portsmouth are ‘Portsmouth Harbour’ (near the area of Gunwharf) and ‘Portsmouth & Southsea’ (near the area of central Portsmouth/ Commercial road). Travelling By Bus - there are four bus stops within 5 minutes walk of the cottage. The closest bus stops are on Winter Road and Highland Road. Slightly further away are the bus stops on Festing Road and Albert Road. •	Our ‘best fit’ guests are families, couples, solo and business travellers. We will consider 3-4 same gender individuals but booking agreement is subject to our discretion. •	Price per night Monday-Thursday £105, Friday, Saturday, Sunday £121 •	Price per night 28 June 2019 to 3 September 2019 £125 •	Minimum nights stay apply depending on season. Variations can sometimes be agreed, please enquire.